Bringing local beer and delicious food together. At some of your favorite local breweries. Blue Blaze Brewing and Fresh Med food truck have partnered together to create a 4 course, hand-crafted culinary experience! Each course will be paired with a 13oz Blue Blaze beer and will feature dishes not found on Fresh Med's traditional menu. 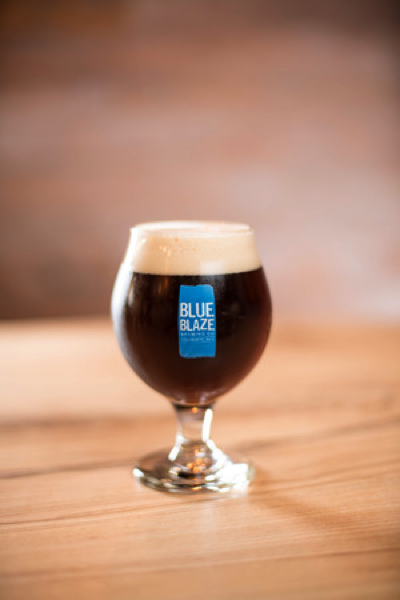 Before each course, a representative from both Blue Blaze Brewing and Fresh Med will give a brief introduction into the beer and food pairing. Our first dinner was a huge success and we had many happy customers at the end of the night! Our second dinner will be held on October 3, 2017 from 6:30-9pm. Tickets are $50 + tax & service charge per person and will only be sold by reservation. 21+ only. This will be one of many collaborations with local breweries and we hope to pair some great local flavors in both beer and food! Scroll down for more information on the food and beer pairings for this event or to make reservations. *PLEASE NOTE that the dishes cannot be modified for food allergies or preferences. The food for this and all Charlotte Beer Dinners is provided by Fresh Med and the menu will change by location. Mixed greens, cucumbers, tomatoes, and a honey mustard vinaigrette. Pork tenderloin with a walnut mushroom sauce and sautéed spinach. Herb roasted chicken with a Kölsch glaze served alongside potatoes au gratin. Reservations are required for all of our beer dinners. Please fill out the contact form below and someone will get back to you within 48 hours. Every attempt will be made to accommodate all parties and seat choices, however reservations are on a first come first served basis. Keep in mind that it is our goal to fill all the seats for this event so smaller parties will be seated with other small parties. Reservations can also be made by calling (980) 224-3486. Must be 21+ to attend. Thank you for your interest in Charlotte Beer Dinners! Someone will get back to you shortly. Currently there are no other scheduled events. Check back for more Charlotte Beer Dinners or fill out the form below to be the first to know! Want to be notified about future beer dinners? Join our email list to be the first to know!